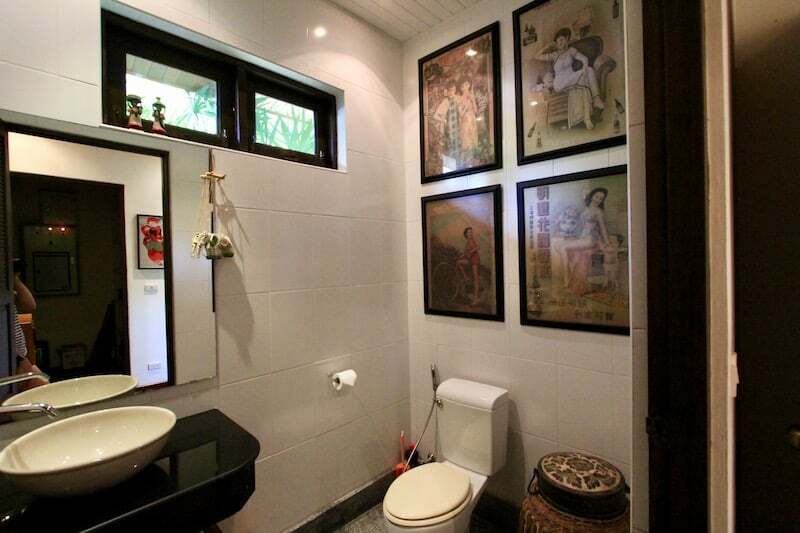 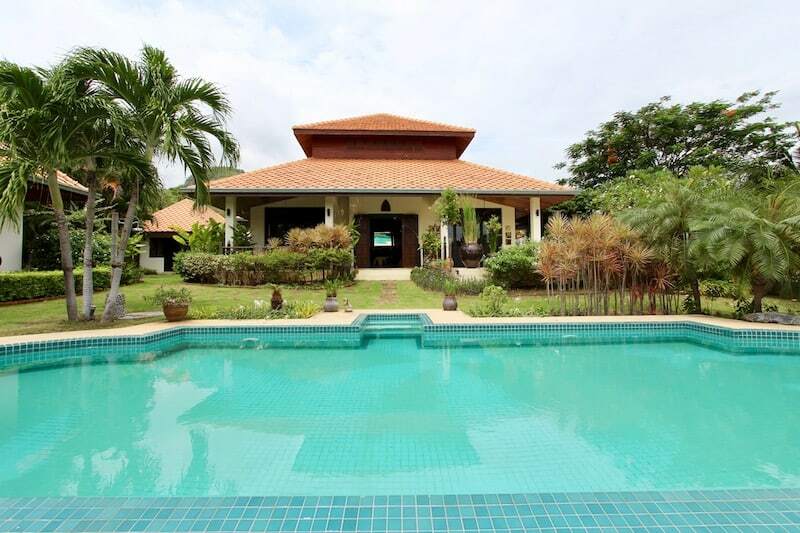 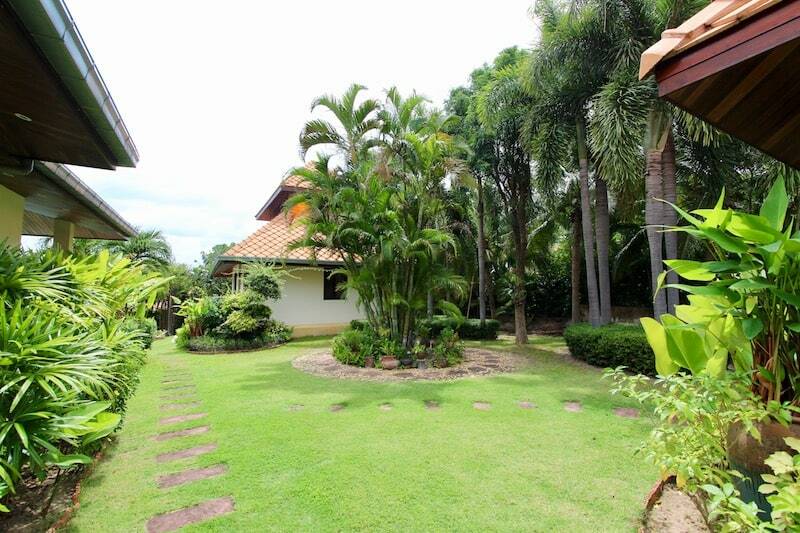 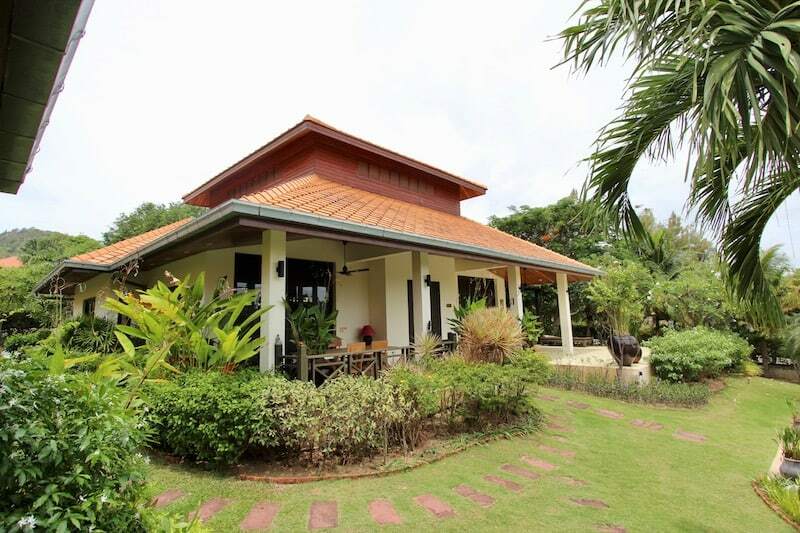 This is a lovely, centrally located Hua Hin villa for sale is surrounded by nature in a lushly planted tropical landscape. 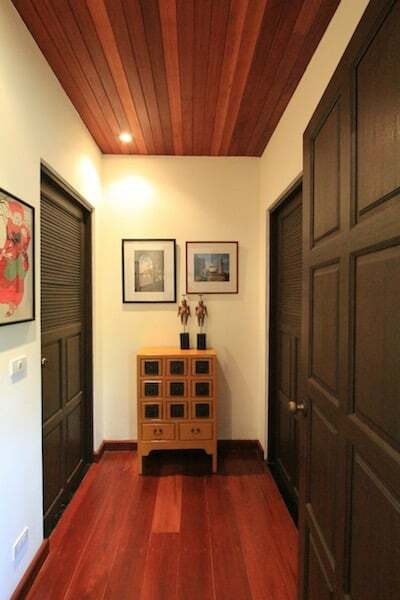 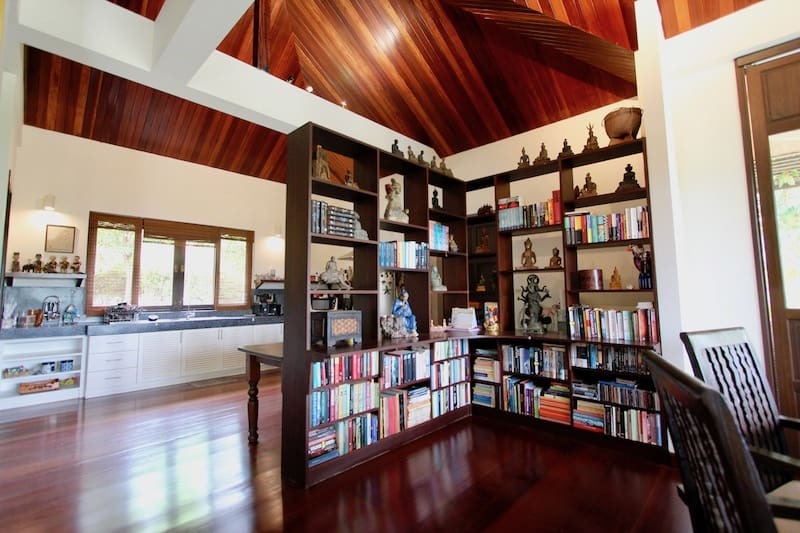 The home is complete with modern amenities, yet retains the Asian inspired influences, including the beautiful old Teak wide plank wood floors, Teak ceilings, and solid wood doors and windows that expand to bring the nature inside. 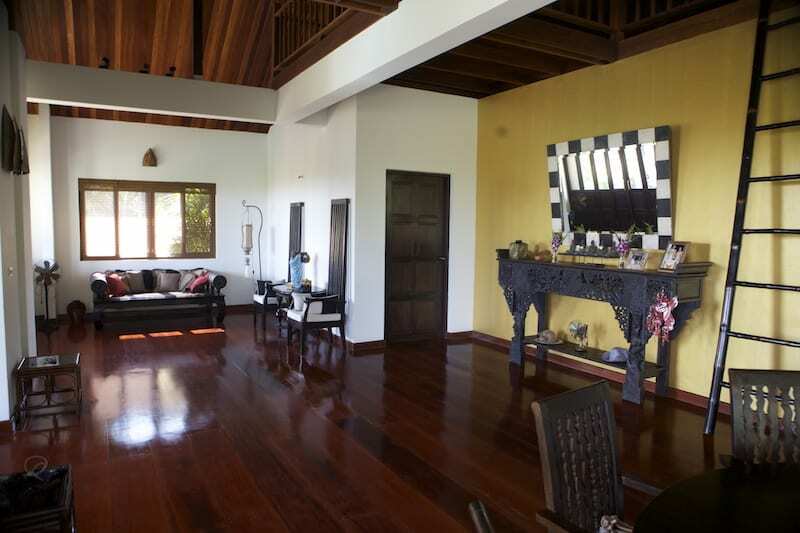 The main living area has impressively high vaulted ceilings made of solid old Teak with exposed beams. 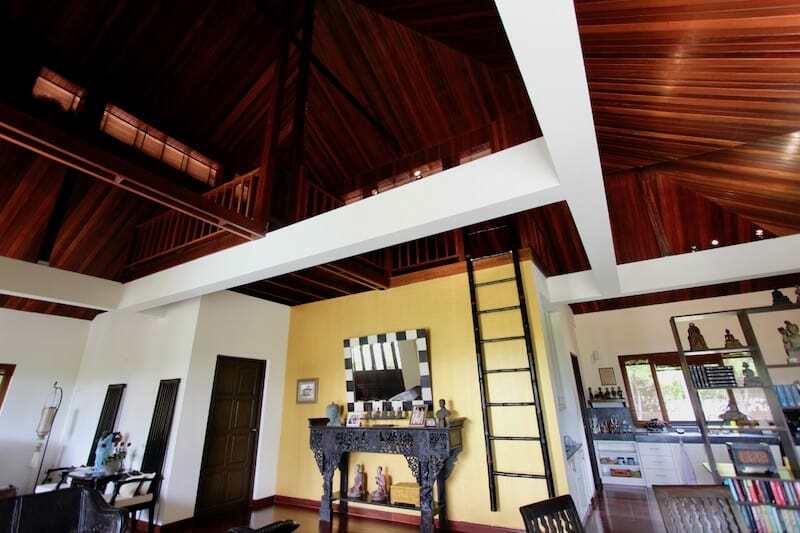 The height allows the warm air to rise and keeps the living room, kitchen and sitting areas cool and breezy. 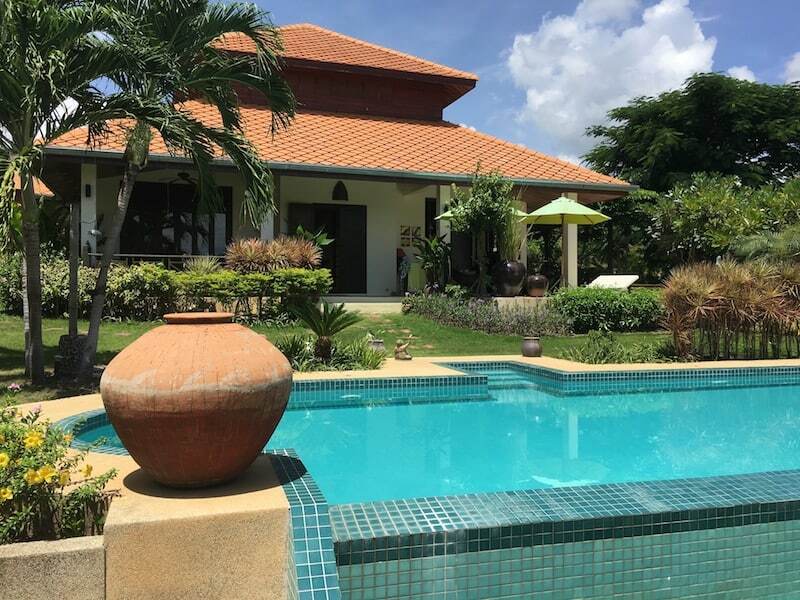 The wraparound, covered terrace is where most of the daily activities are enjoyed, as this space is always shaded and has the fantastic views of the lush gardens and the 14 x 5 m saltwater swimming pool. 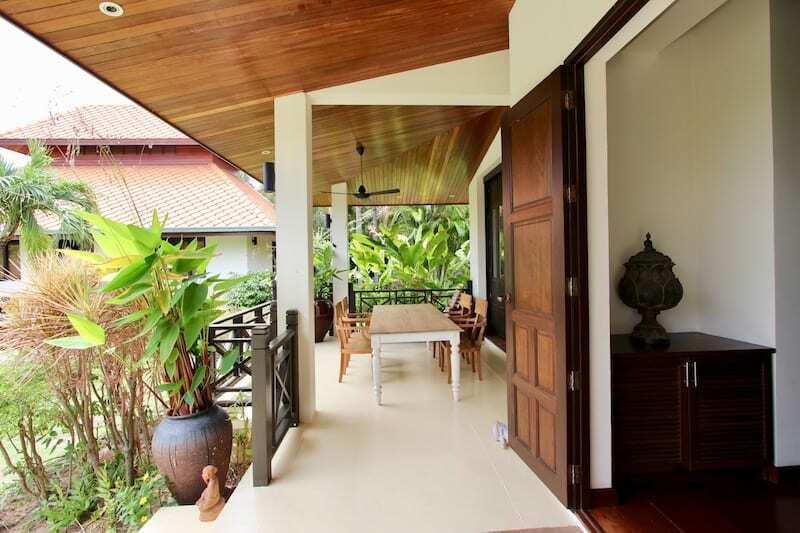 The property is composed of the main house; a separate guest house with 2 bedrooms, each en suite; a maid’s room and storage/utility room; and the large garden, swimming pool, privacy wall and entrance gate. 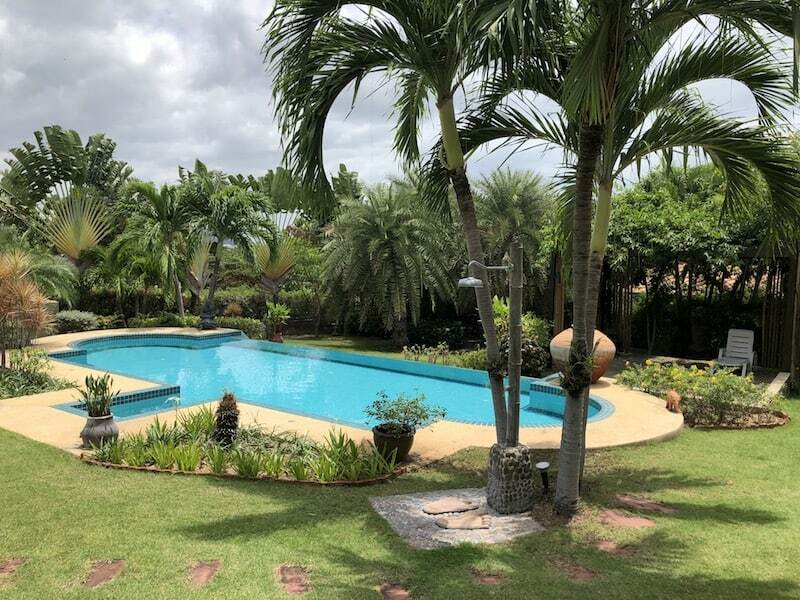 The land is 2,150 m2, full Chanote title deed and can be owned freehold or leasehold, and is within one of the most prestigious developments in Hua Hin, less than 5 minutes south of town center. 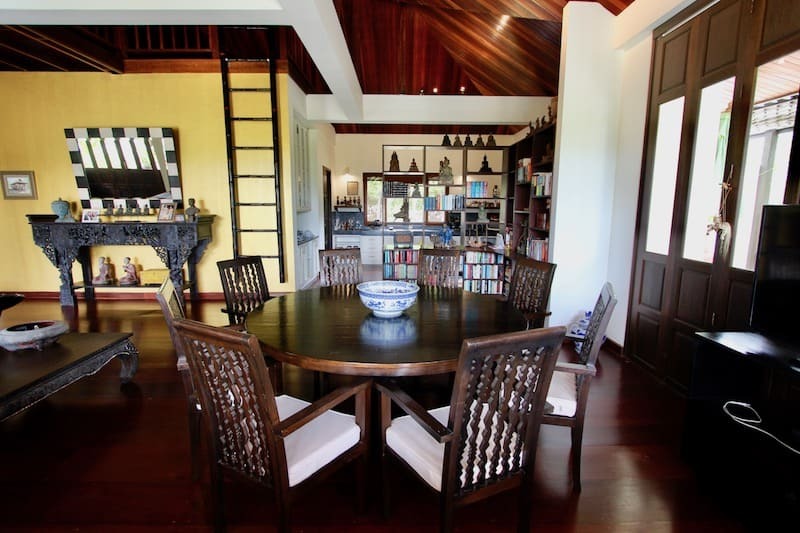 The main house includes the master suite, the open plan living and dining room, the kitchen, a storage area, the main wraparound terrace, and an outdoor kitchen with gas wok/stir-fry. 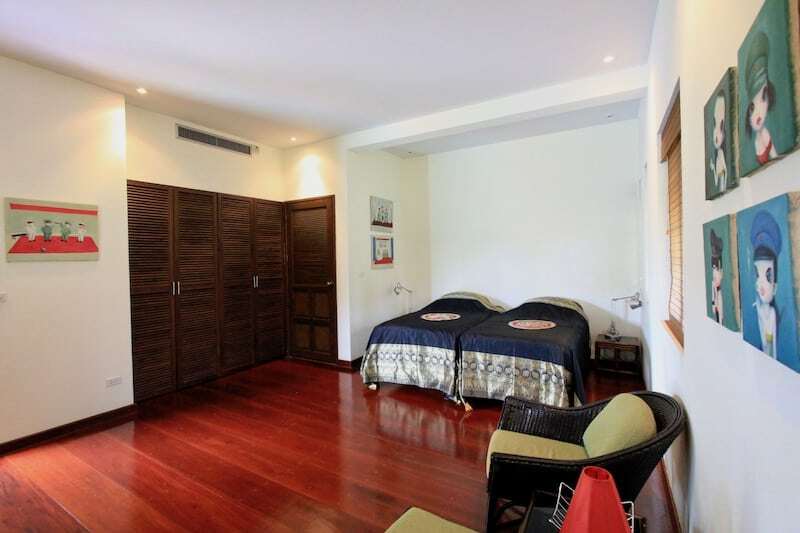 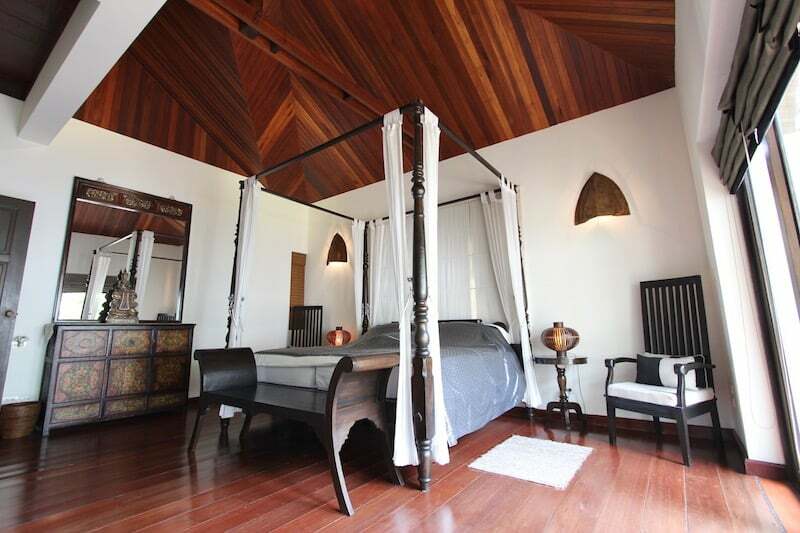 The master bedroom has old Teak wood floors, a built-in wardrobe, a solid wood canopy-style king bed and an en suite bathroom. 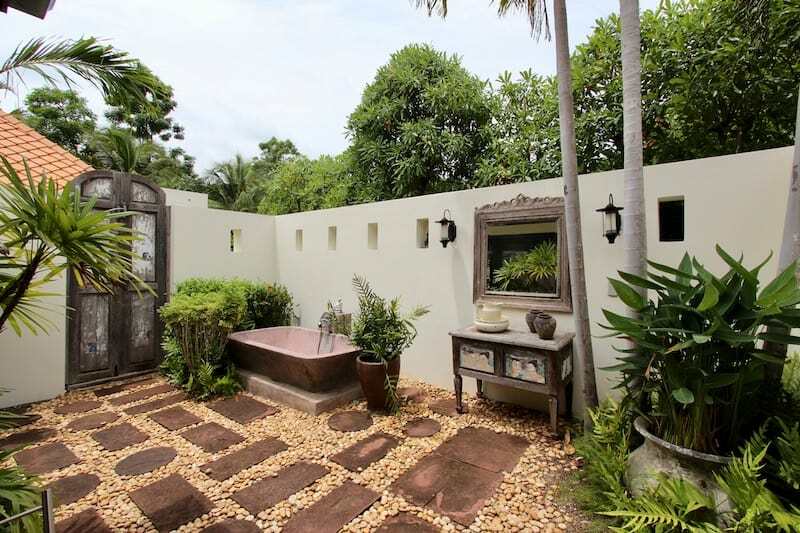 The master bathroom enjoys a large outdoor garden bathtub and shower, along with an interior shower and double sinks with granite countertops. 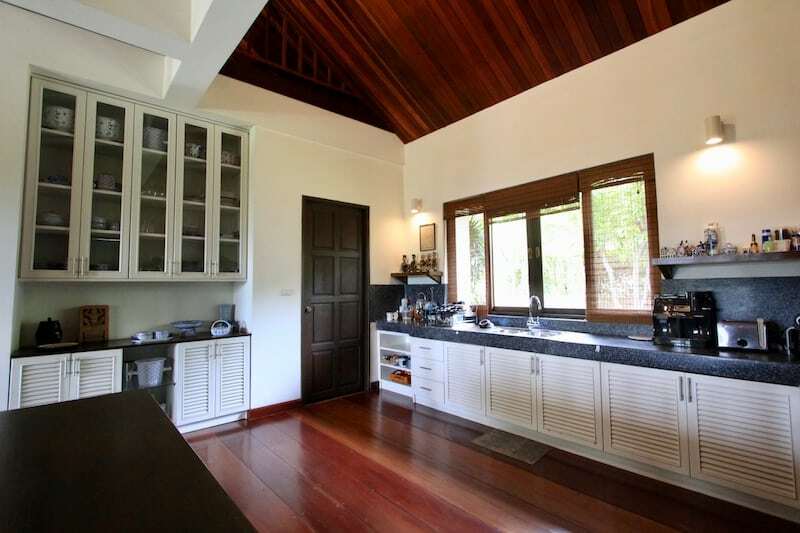 The kitchen is separated by a custom-designed bookshelf that doubles as a partition wall, and there are many beautiful, original furnishings included in the sale, at a value of well over 1.5 M THB. 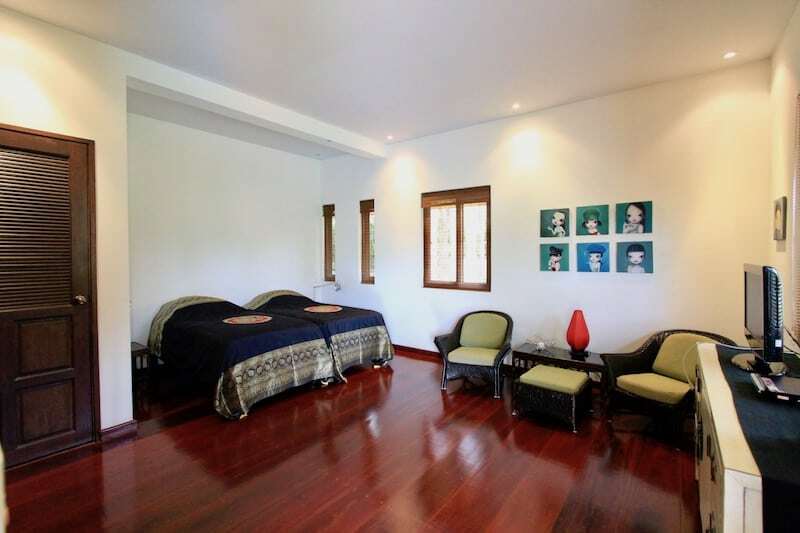 The guest house is just next to the swimming pool, and enjoys its own private, wraparound terrace. 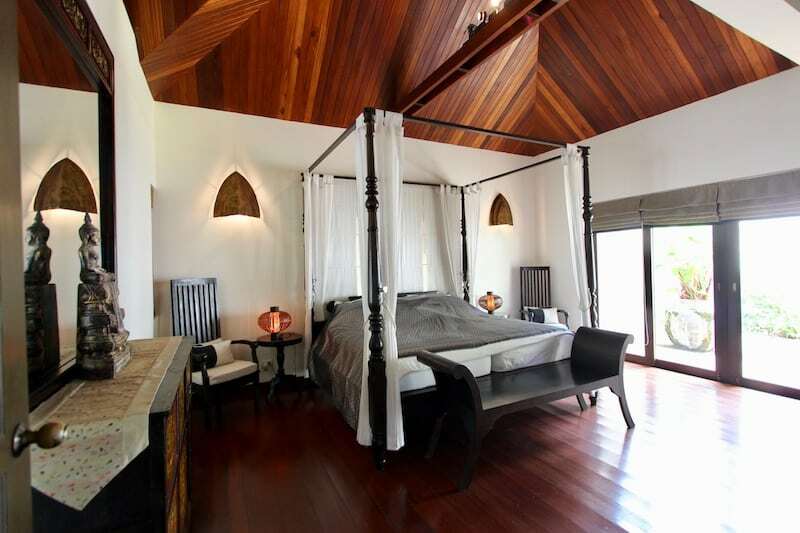 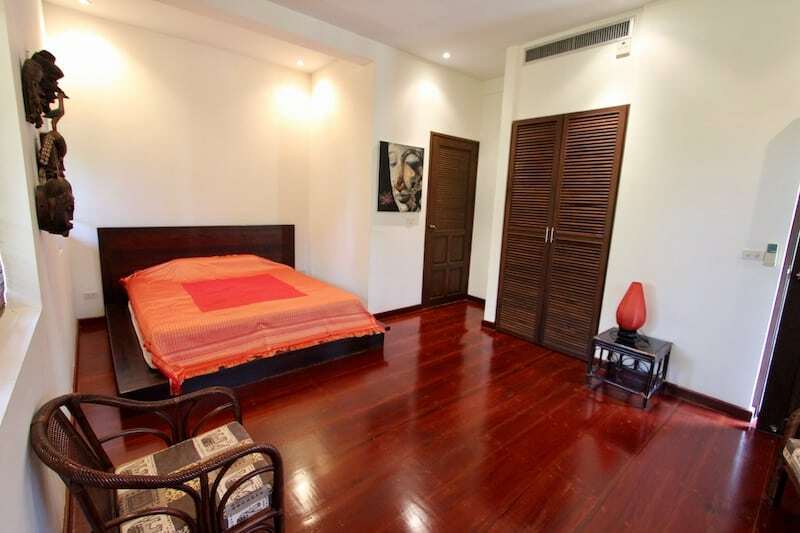 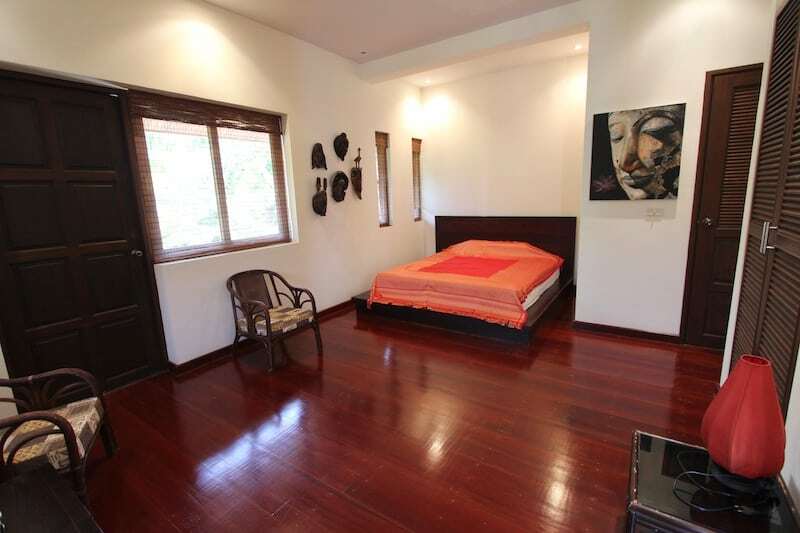 There are 2 comfortable bedrooms, each with its own en suite bathroom, wardrobe, and air conditioning. 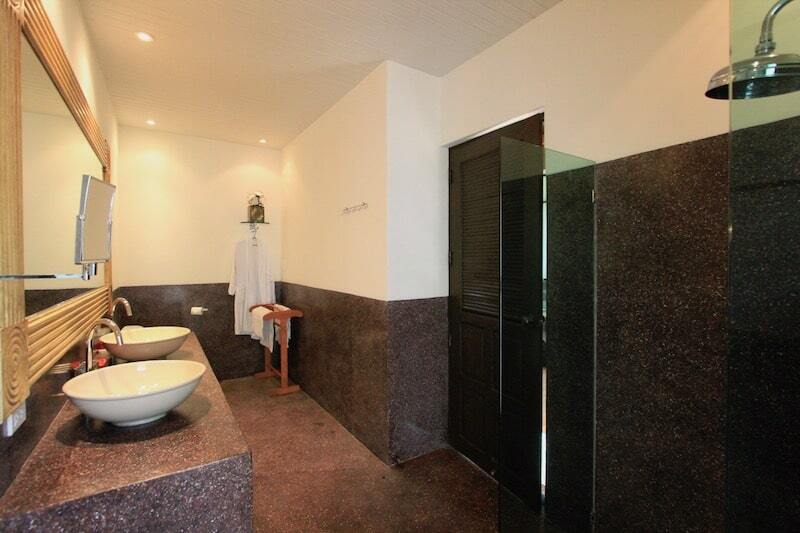 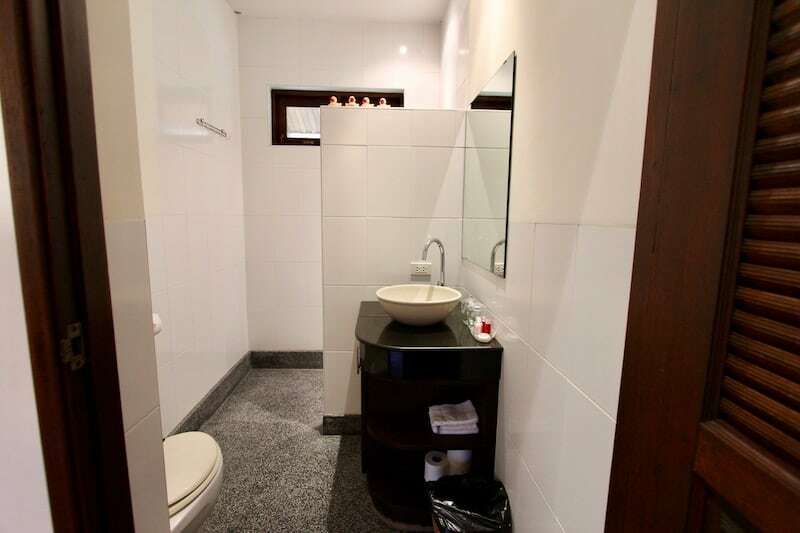 The maid’s room is spacious with a bathroom, an adjacent storage room and terrace. 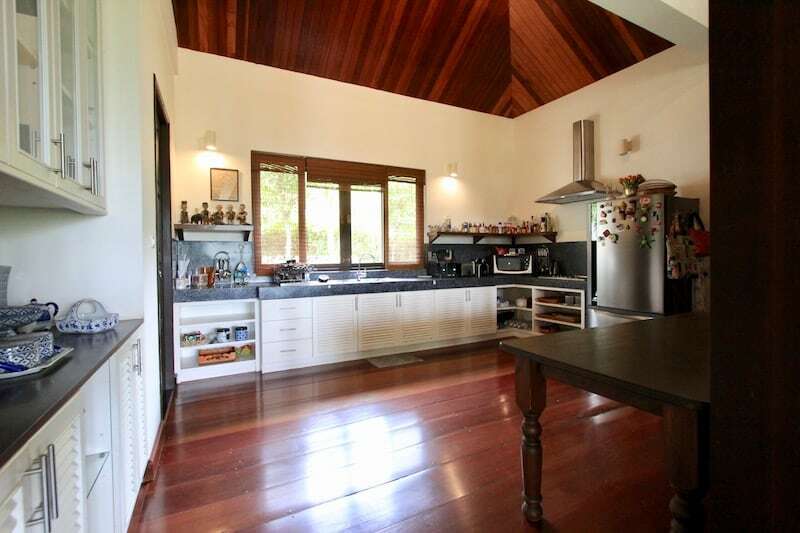 This is truly a stunning property and needs to be seen in person to fully appreciate. 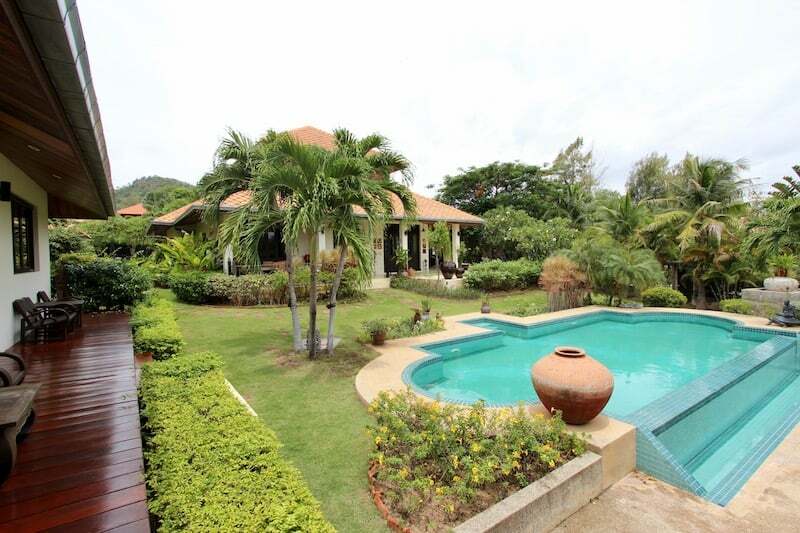 The property is currently owned via leasehold, although the land is also available for sale and can be owned freehold with full Chanote land title deed. 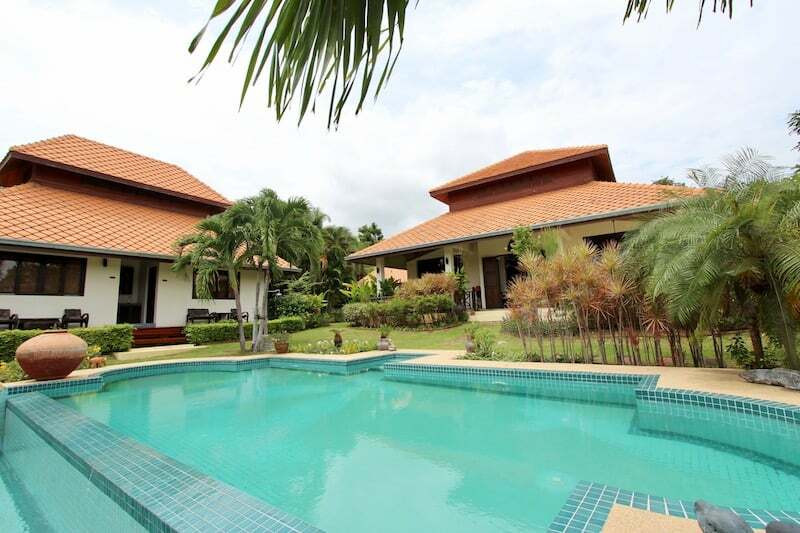 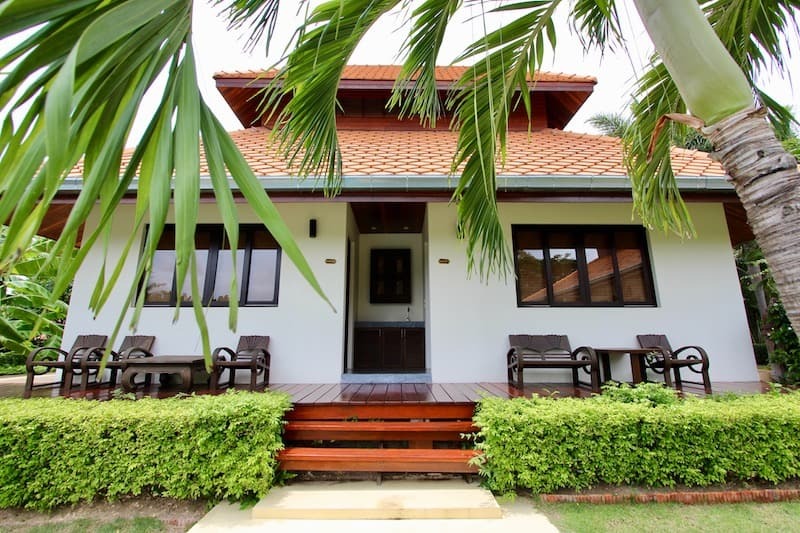 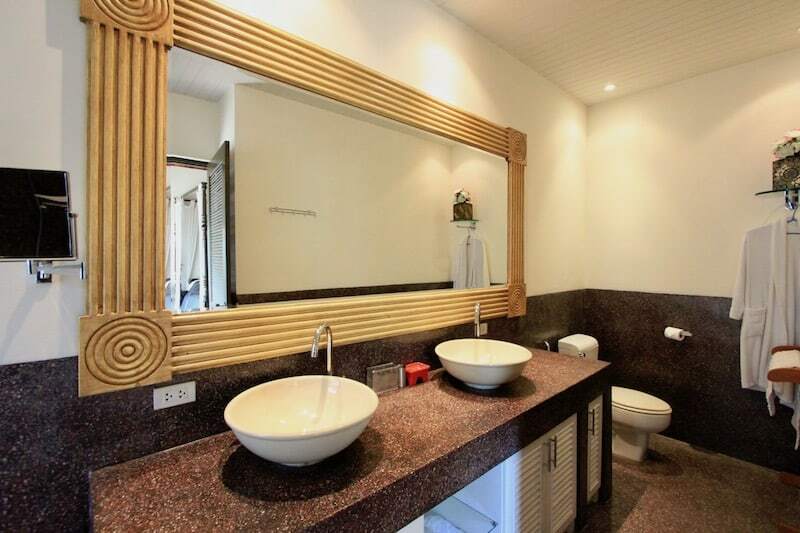 The property is within a meticulously maintained, completed development of similar, high quality homes only 5 minutes to downtown Hua Hin and to the surrounding beaches. 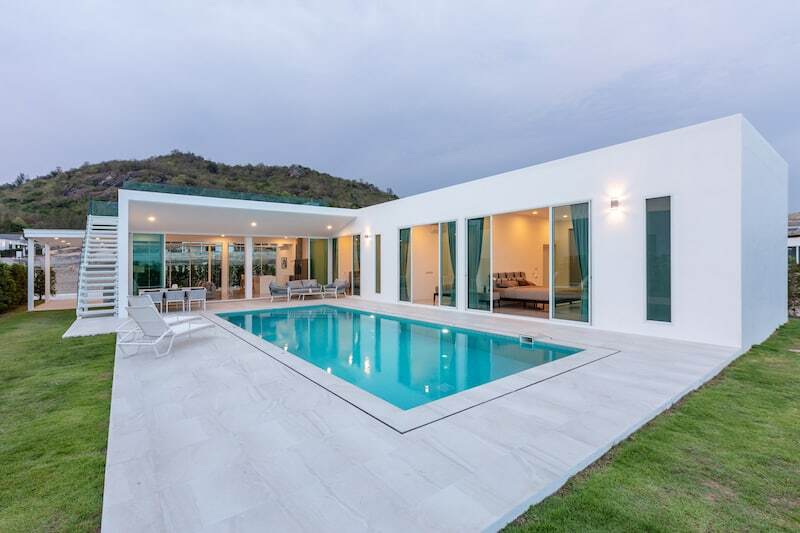 For more information and to schedule a viewing of this Hua Hin luxury villa for sale, please contact Executive Homes Hua Hin at +66(0)85.264.2158.